The world would be a better place if we all had the opportunity to read more. This is the belief and the driving force of the South African Book Fair. 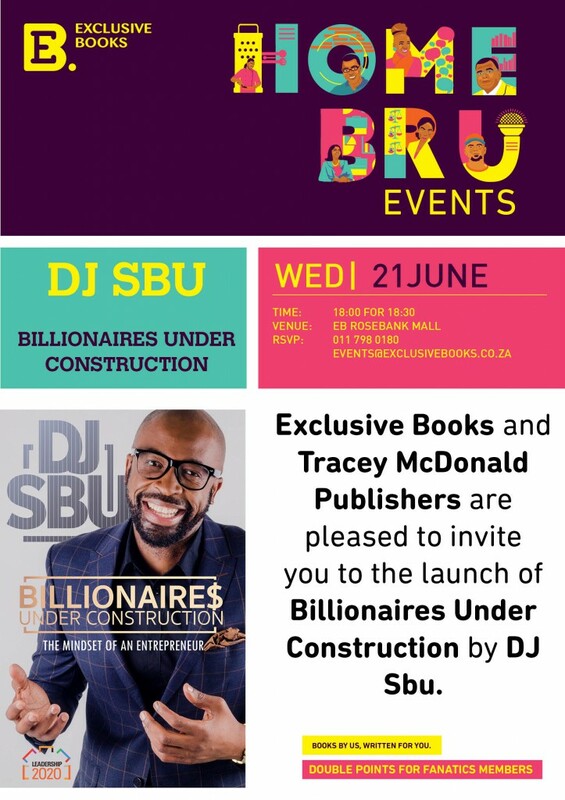 For the first time, Johannesburg will be able to enjoy the exciting literary programme designed to satiate the appetites of the most voracious reader, as well as inspire new ones. The campaign theme for this year’s Fair is #DiscoverYourBookself. Imagine 100 authors participating in more than 40 events, 44 new small publishers, 7 publishers from across the continent, a dedicated Kid’s Zone, and a whole day devoted to learners, teachers and librarians. Now stop imagining, and book your ticket. The Fair will be held at Turbine Hall, Newtown, Johannesburg for three full days from 31 July to 2 August. 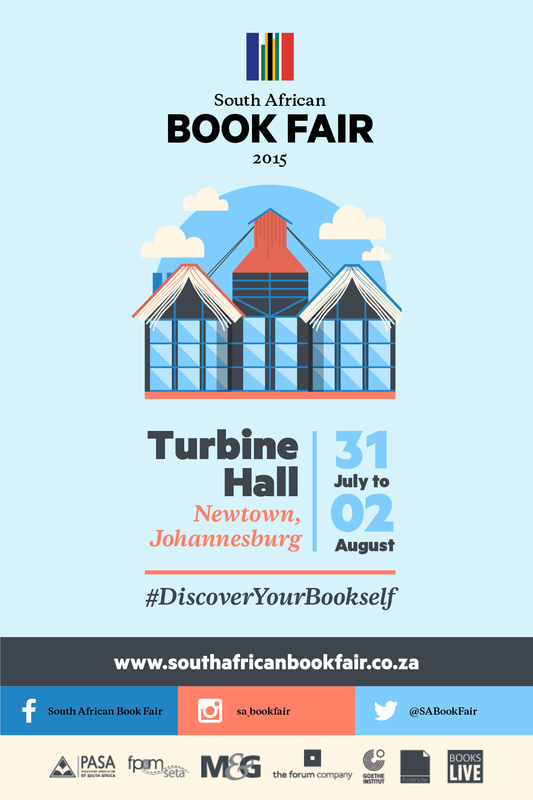 Whether you’re a life-long lover of books or are still looking for your book passion, kindle the flames at the South African Book Fair 2015. In 2011, a group of Kingsmead College parents hosted a small Book Fair for the school community at which eight top South African authors spoke. The response from the parents, teachers and girls was so overwhelming that the parent body felt encouraged to grow the Fair and make it a public event for all to enjoy. Now in its fourth year, the Kingsmead Book Fair is proud to have become a significant event on South Africa’s literary calendar. The sessions take the form of one-on-one conversations, discussions between two or three writers and a facilitator, and occasional talks. There’s plenty of comparing, sharing, discussing and debating on the day. The number of participants grew last year to well over 70, as did the number of visitors who came to listen to their favourite authors, journalists, entertainers and newsmakers discuss a wide range of topics, debate our politics, chat about their books or simply entertain us. Book via Webtickets or on the day: Entrance fee R30, each session R50 per person. Click HERE for the full programme and HERE for a list of authors attending. To bring together a broad cross-section of mostly South African English-speaking writers and a few distinguished authors from overseas, aiming to present quality events that inspire and inform. To raise funds for local community and school libraries, for which the FLF Library Fund was established. The emphasis is on informal discussions and spirited debates between several writers with a chairperson, or one-on-one conversations, and occasional talks. Starting at 10am and ending at 5pm, up to nine one-hour events run concurrently with half an hour between each (except where otheriwise stated). Fringe events include literary and publishers’ dinners, book launches, writing workshops, a school spelling bee, wine writers’ prizes and classical music concerts. Click HERE to view the 2015 programme and click HERE for a list of the authors attending. 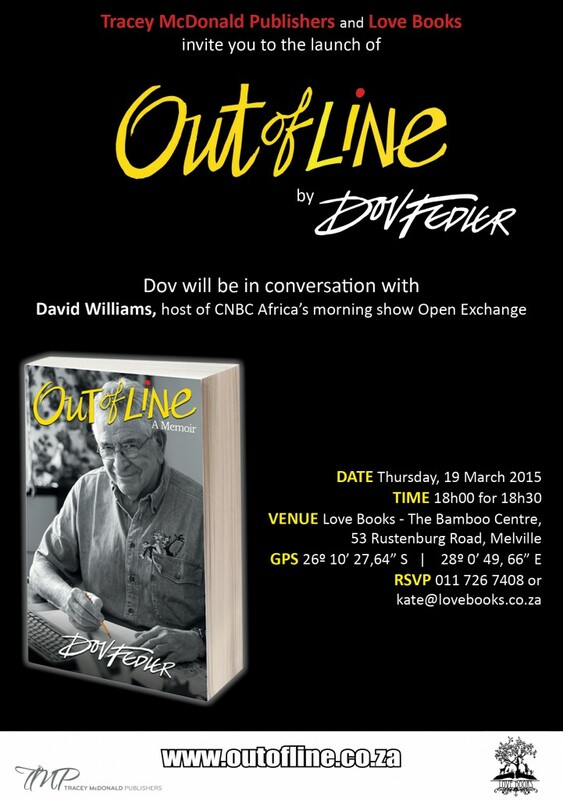 Tracey McDonald Publishers and Love Books invite you to the launch of Out of Line by Dov Fedler on Thursday, the 19th of March 2015 (18h00 for 18h30). To read more about Out of Line, click HERE. Nal’ibali, the national reading-for-enjoyment campaign, is calling on all South Africans to join them in celebrating one of the most important dates in the literacy calendar, World Read Aloud Day, on Wednesday 04 March. Raising awareness of the importance of reading aloud for children’s literacy development, and attempting to break its read-aloud record from 2014, the campaign is asking adults across the country to read aloud the same story on the same day to the children in their lives. Each year, Nal’ibali commissions a new story to share on this day, and makes it available in all 11 official languages. This year’s story has been written by one of South Africa’s best-loved storytellers, Gcina Mhlophe. To sign-up, download, or to print out Nal’ibali’s special World Read Aloud Day story for yourself, your school, crèche, staff or others in your area, visit www.nalibali.org, www.nalibali.mobi or email info@nalibali.org. Gareth Patterson’s long-awaited autobiography My Lion’s Heart is a moving account of one man’s single-minded dedication to the preservation of Africa’s wildlife. It is also a stark reminder that if the human race does not want to lose Africa’s priceless wild heritage there is no time to waste. Environmentalist, independent researcher and author, Gareth has spent his entire adult life working tirelessly for the greater protection of African wildlife and, more particularly, for that of the lion. Born in England in 1963, Gareth grew up in Nigeria and Malawi. From an early age he knew where his life’s path would take him – it would be in Africa, and his life’s work would be for the cause of the African wilderness and its wild inhabitants. His is an all-encompassing African story. From his childhood in West and East Africa to his study of a threatened lion population in a private reserve in Botswana to his work with George Adamson, celebrated as the ‘Lion Man’ of Africa, we witness Gareth’s growing commitment to his life’s mission. This is nowhere more evident than in his account of his life as a human member of a lion pride, experiencing life and death through its eyes, as he successfully rehabilitated three famous orphaned lion cubs back into a life in the wilds. At considerable risk to his own personal safety, he exposed the sordid canned lion ‘industry’ in South Africa, bringing this shameful practice to international attention. 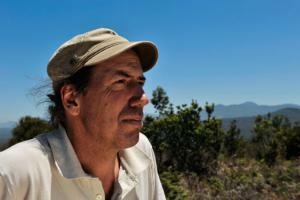 After moving to the Western Cape he took up the fight for the African elephant, notably the unique endangered Knysna population, and published his astonishing findings in his 2009 book The Secret Elephants. Perhaps unsurprisingly, given the stressful nature of his work, Gareth suffered a massive physical and mental breakdown in his forties, which he discusses here for the first time with an openness that underlines his courage. Lesser men might have been broken, but his ‘lion’s heart’ fought back and he ultimately overcame his illness. View the official book trailer below, and watch it twice – the first time round read the words, the second time round listen to the lyrics of the song. 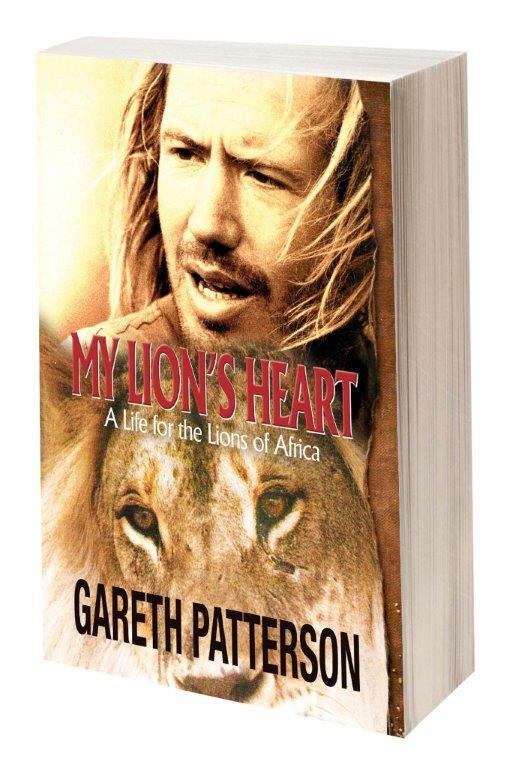 Gareth Patterson will be launching his autobiography My Lion’s Heart – A Life for the Lions of Africa on Thursday the 23rd of October, at 18h30. Gareth Patterson is known internationally for his efforts to greater protect the lions and elephants of Africa. His wildlife work has featured widely in the media, books and in documentaries. His books have been published in many editions and languages worldwide. Patterson was the recipient of the Operation Survival Award and of the prestigious Cape Times Environmental Award. He has been an adjudicator for the SAB Environmental Journalist of the Year Awards. The Search for the Knysna Elephants, a documentary about Patterson‘s findings on the remarkable Knysna elephants, has been screened internationally by Animal Planet. He is continuing his research on the elephants, as well as undertaking field work on the existence of another mysterious denizen of the southern Cape, the previously unknown about coastal leopards. A highly self-motivated person who lives by the adage ‘Never give up’, Patterson delivers inspiring presentations and talks drawn from his life and experiences. The pace and range of crime writing, be it fiction or non-fiction, continues to grow in what must be the world’s biggest genre. It’s estimated that almost a quarter of all commercial books published in the English language today are crime centred, and if you look at movies, many of them seem to be based on books where authors do the hard work and the research, and see their creations through to the big screen. Crime novels have their fashions: right now the word is that Scandi crime has given way to Inuit crime. Whatever it is, South African writers are turning out world class, memorable books. This year is no different. 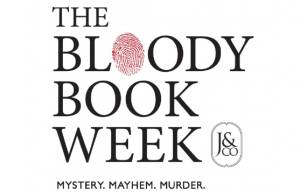 The Bloody Book Week will be attended by Peter James who failed to make it last year after a car accident. With 14 million copies of his Roy Grace Novels sold and more on the way, they’re thrilled to host him this year. But the same applies to Deon Meyer and the pack of journalists battling to get their Oscar Pistorius books out first into that lucrative world market. What absorbs us are the stories behind the stories and we have several events where you can go behind the Oscar scenes with the likes of Barry Bateman and David O’Sullivan – and many others. The Director and Founder of the Bloody Book Week. Jenny Crwys-Williams is a talk show host with South Africa’s first all-talk radio station: Talk Radio 702. She has her own show, the content of which ranges from current affairs to food and from in depth interviews with prominent people to books – in fact, anything of interest. She has become well-known in South Africa for her influential weekly Talk Radio 702 bookshow. Jenny & Co is Jenny’s private bookclub, founded 10 years ago. It has 4 000 registered members who come to author events which include weekends, an end of year week of authors and books at the theatre (In Conversation) – and to her latest venture, The Bloody Book Week, Africa’s first crime book festival. Born and brought up in South Africa and Zimbabwe, Jenny spent over a decade in the United Kingdom. It was there, with its access to the arts, that she decided she wanted not only to write books but to promote them and their authors, particularly local writers. She has written and compiled 11 books of her own, all non-fiction, ranging from South African Despatches to A Country at War 1939-1945 and In the Words of Nelson Mandela. 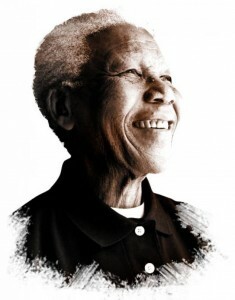 Nelson Mandela International Day was launched in recognition of Nelson Mandela’s birthday on 18 July, 2009 via unanimous decision of the UN General Assembly. The message behind Mandela Day is simple – each individual has the ability and the responsibility to change the world for the better. If each one of us heeded the call to simply do good every day, we would be living Nelson Mandela’s legacy and helping to build a country of our dreams. 2014 is particularly symbolic as we work to honour a great statesman and make every day a Mandela Day as we mark South Africa’s 20 years of democratic freedom. Mandela Day is a global call to action for citizens of the world to take up the challenge and follow in the formidable footsteps of Madiba, a man who transformed his life, served his country and freed his people. Its objective is to inspire individuals to take action to help change the world for the better and in so doing, to build a global movement for good. The question we must ask ourselves is what we are doing to make the world a better place; what are we doing to make every day a Mandela Day? Mandela Day is dynamic and ever-changing: it belongs to everyone and can take place anywhere, at any time. We urge everyone to find inspiration for their contribution in the legacy of Nelson Mandela and to serve their fellow humans every day. 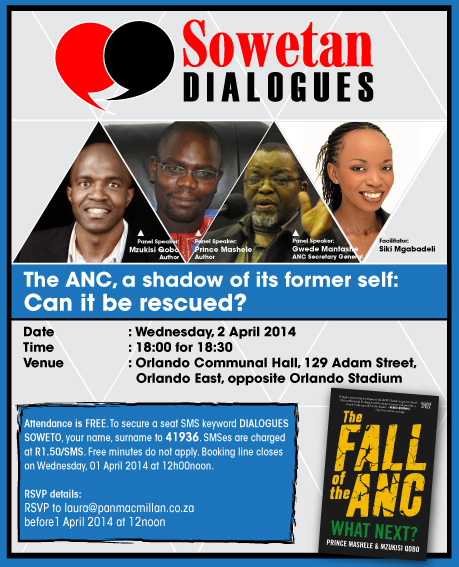 Sowetan Dialogues – Can the ANC be rescued? An interesting event, with the authors of The Fall of the ANC – What Next?